Parenting an anxious child isn’t easy. At times, even the best-intentioned parents are overwhelmed trying to manage daily life with a child battling anxiety. Plans, expectations and dreams for your family can get lost. Yet you serve a critical role in helping your child and that keeps you going. Here are 10 things that can help you navigate this difficult course. Be careful to not “over” protect. Overprotection is hovering over a child and being hyper-vigilant about danger. When parents do this a child is restricted from learning how to deal with life’s difficulties on her own. Let your child handle as much as possible. It is important that she feel she has worked through this and not been rescued by mom or dad. Parents are tempted to make more decisions for an anxious child. Look for opportunities for your child to experience control over her own life. Never underestimate how carefully your child is observing you. They model the sense of danger and fear in their parents. Watch out for Anger and Criticism. Critical, angry and rejecting parenting evokes self-doubt, perfectionism and chronic fear of judgment. Reactions that are most unhelpful for anxious children include: chastising, embarrassing, and humiliating a child, particularly in front of family or peers. A child is less likely to be confident about his abilities to overcome fear if he is belittled. It’s tempting to sometimes use humor to deflect a tense situation, but it must only be used if he finds it amusing. The use of humor if it is sarcastic or hurtful to the child is not appropriate and may make the child feel angry or humiliated. Be mindful of your negative thoughts. You might be tempted to think your child is being ridiculous and unreasonable. You might think he is faking this to accomplish something else or, if he really tried, he could stop. Those thoughts are almost certainly wrong and either way, they will cause you and your child to mutually withdraw, and that makes it worse. This doesn’t mean that a child should be allowed to engage in misbehavior with no consequences, but the goal of consequences should be not merely to punish, but to help the child learn what to do differently next time. Failure to accept the reality of the anxiety can make you miserable. Anger and frustration are protests that you don’t like the way something is in your life! If you are mad about this in your heart then you will be more reactive when your child’s symptoms show up. You will know you have not accepted it if you find yourself thinking things such as, “Why me?” “I can’t take this” or “Why are you so screwed up?” Here is the plain reality: You child’s anxiety will mess up your plans. If you accept this you will experience more peace while you face a difficult process. Children need to feel a bond with parents. In the psychological literature this is called attachment. This happens when a parent is interested and observant of their children. Central also is being responsive and agreeable to what your child says and does. Compassion and being attuned is also part of this bond. If this doesn’t happen consistently it leads to a sense of insecurity that can be a factor in anxiety. If a child is not sure a parent is essentially available it can lead to emotional problems. This doesn’t have to be done perfectly (that is impossible) but it can be done consistently. Validate and acknowledge your child’s feelings. This doesn’t mean you agree with every one of your child’s emotions regarding a given situation but it does mean you listen and are empathetic towards your child, hearing them out and letting them know you care and will be there to offer support. You have probably already experienced this but when they are wound up, they will be unable to accept your solutions or perspective. Don’t push a better perspective if your child is clearly agitated. Your child needs to know you know how bad this feels. In a very intense moment, don’t try to talk them out of it, it will feel like you are discounting their emotion. Compassionately reflect back the emotion. Later after they calm down you can respond to specific comments and behaviors. One of my clients was talking to a partner and said, “I feel like I just walked in and told you a great white shark bit off my arm and you are trying to tell me I shouldn’t be upset because I have three limbs left.” Children are always watching and paying attention. It’s important that you model healthy ways of handling stress and anxiety so your perceptive child can understand and process how to do the same for himself. It’s particularly important for you to remain calm when your child becomes anxious about a situation or event, and even more so during a meltdown. Allow the meltdown to run its course while remaining calm. Respond with praise and recognition to even small accomplishments and steps your child makes in response to her anxiety. Those could make all the difference. I like to tell parents, “Don’t fret over what your child cannot do, rather focus on what they can do.” Rather than abandon the step she is taking, make it smaller. Then your child will at least make some steps toward facing the problem. Every little bit counts. Encourage that like crazy! Keep the focus on what she did. One of the biological responses during anxiety is a narrowed focus. Remind your child of the bigger picture. This is only part of her life and most of life has been fine. It is just anxiety. As one poet wrote, “Feelings are not final.” Catastrophic futures are also part of anxious thinking so describe all the hopeful possibilities that could also take place. Think of yourself as coach or cheerleader and encourage them to learn the game and succeed. Don’t reinforce your child’s fears with avoidance, encourage tolerating the fear and facing it. If your child is struggling with a specific fear or anxiety, don’t reinforce the fear, but encourage the child to face his particular stressor, understanding that it won’t suddenly go away, but will lessen in time as he faces it. Be aware of anxiety’s favorite ploy: avoidance. Anxiety must be faced to be overcome. If you are familiar with the treatment for anxiety you probably know or have heard about exposure and response prevention (ERP). It is a central part of effective treatment. It is important because the first response to anxiety is to escape or fix it, anything to make it go away. That avoidance becomes a key element in an anxious cycle that either perpetuates or makes it worse. These avoiding behaviors become ways to “play it safe.” Clinicians call them safety behaviors. While it briefly takes the edge off the anxiety it interferes with overcoming it. Exposure can permanently and effectively reduce, if not eliminate anxiety. Anxiety is scary to parents. Kids aren’t the only ones who avoid it. You get so tired of it you would do anything for a break. For example, after a while you figure out that sometimes talking to your child about their anxiety can make it worse, so you avoid it. You may covertly help you child avoid anxiety triggers just so you won’t have to deal with a possible meltdown. We did. I get it. Unfortunately that is one of the worst things you can do. Anxiety must be faced for it to go away. Keep working on it. Expect some resistance. Make sure to manage and modify expectations during especially stressful periods. Don’t shield your child from any and every anxiety-provoking situation. Avoiding anxiety includes assisting your child with rituals, providing continuous reassurance, complying with demands or rules, or going out of the way to shield the child from anxiety triggers. Help your child put a plan in place to handle stressful events and situations. Don’t leave them unprepared. Learn how to talk things through with your child and help them communicate the specific things that would help them through a particularly stressful event or situation. Being able to talk through things with someone they can trust, can truly be helpful for a child and also reduce the uncertainty of a stressor in a very healthy way. Sometimes, children just need a little boost of confidence to get through the anticipatory anxiety. However, don’t become a slave to their fear. You can be reasonable but not be dominated by the fear. Stay calm as you talk about options and they will take some strength through that. Your child will need way more help than usual and you will have to arrange for that. Here are some options 1) talk to your pediatrician, 2) start learning how anxiety is treated, 3) consult with a therapist, 4) obtain self-help, online and other resources like Turnaround, and 5) if school is impacted, contact the appropriate staff to develop a plan. Anxiety is treatable but you have to act. Like me, you might be shocked by how long it takes to treat your child’s anxiety. Anyone struggling with anxiety gets impatient. Family, friends, and organizations get impatient. Be hopeful and realistic. 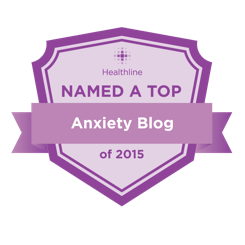 Sometimes anxiety seems to go into remission and everyone breathes a sigh of relief. Then just when everyone hopes it is finally over, it returns causing a major MELTDOWN! Anxiety is treatable but complicated. The perspective you need is that you will keep working on it until it is better. Don’t base your hope on every up and down. The fact is that it takes as long as it takes. Hang in there. We have been there, made it to the other side and so can you.